The Funky Monkey Babys were a part of the reason that I received this regional Pretz as a gift. One of my students attended a charity concert for the victims of the Tohoku disaster in Sendai and picked this tidbit up for me. Zunda, as a few folks may recall from a Zunda KitKat review, is mashed soybean and is used in cuisine in northern Tohoku. When my student gave it to me, I asked her if she had already sampled it, and what she made of it. She made one of those faces which suggested that, if you don't have anything nice to say, don't say anything at all. When she relented and gave an opinion, said it was very salty, and that it was good with beer. Beer makes everything better, it seems. I'm sure it's how men manage to watch interminably boring professional sports. 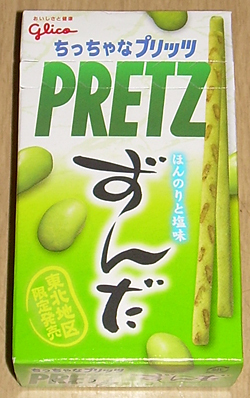 Being a teetotaler, I'll never know for sure, but I'm going to try these Pretz with Coke Zero. This is a tiny little box of Pretz with zero information printed on the box. I'm guessing it was part of a multi-pack of souvenirs that one could buy and distribute to friends and coworkers after a scenic trip to what I'm sure many believe is a rapidly expanding nuclear wasteland in the general area. Still, it can't be all bad if the Funky Monkey Babys are willing to go there. A little research revealed that this was, indeed, part of a 6-pack for 630 yen ($8.26). Each box is 27 grams (just shy of an ounce). It's on the expensive side for the volume of snacks, but on par for souvenirs. My expectation was that this was going to be pretty good. My students reluctance to endorse it didn't really daunt me because many Japanese people have more sensitive palates than foreigners do. This is due to the fact that much more food is subtle or bland in Japan rather than flavor blasted. I guessed that what was too salty for her may suit me just fine. The sticks are half as tall as usual sticks. They are impressively green and smell strongly of edamame. One bite revealed why this is so. 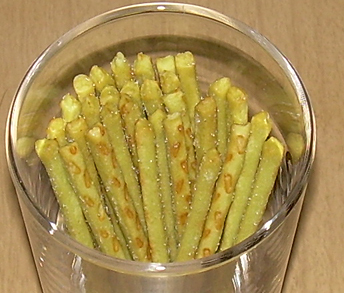 They have an strong, but not unpleasant, chlorophyll flavor and are like having a mouthful of edamame. They've definitely done a good job of incorporating the flavor of zunda. The other savory flavors, like chicken extract, build up the flavor profile but don't separate out from the basic soy bean flavor. Despite what my student said, I found these strong and flavorful, but not particularly salty. I really enjoyed these and would definitely consider having them again if they become available locally. If you really, really love edamame, these should float your boat, but they may not suit all tastes. For me, I found them unique and refreshing.